We may not need semiconductors in the future. Since the invention of microelectronic devices like transistors and the integrated circuit in the 1940s and ’50s, semiconductors have been the backbone of electronics. However, current microelectronic devices are limited by natural semiconductor properties, such as band gap and electron velocity. Now, a team of scientists from UC San Diego could make these limitations a moot point as they’ve found a way to create semiconductor-free microelectronics. In a study published in Nature Communications, Ebrahim Forati and his team reveal that they have built the first semiconductor-free, laser-controlled microelectronics device. Their device makes use of free electrons, similar to how vacuum tubes did it way back before the era of semiconductors. The difference is these researchers have managed to dislodge electrons to carry a current through space at a nanoscale size. Existing vacuum tube tech required high voltages, high temperatures, or powerful lasers to knock electrons loose, all of which would be very difficult at the small scale required for microelectonics. 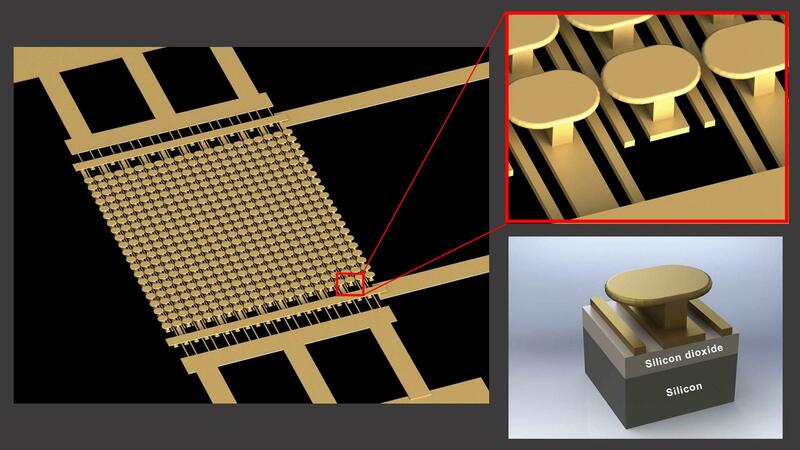 To get around this, the team at UC San Diego constructed a gold “mushroom” nanostructure with adjacent parallel gold strips. Using a small amount of voltage (10 volts) and a low-powered laser, they were able to dislodge electrons from the gold metal. The innovative system created by the researchers produced a 1,000 percent increase in the conductivity of the system, enough “to realize on and off states, that is, the structure performs as an optical switch,” the study reports. The tech these researchers have developed can work with less resistance, making it capable of conducting higher amounts of power — enough to replace semiconductors as a transistor, a power amplifier, or a photodetector. It could be applied to such fields as photovoltaics, the environment, and weapon development, the latter unsurprising as the Defense Advanced Research Projects Agency (DARPA) funded the project. “Next, we need to understand how far these devices can be scaled and the limits of their performance,” says researcher Dan Sievenpiper. If they are able to make their tech affordable and conducive to widespread implementation, it could revolutionize consumer electronics and even bypass Moore’s Law.